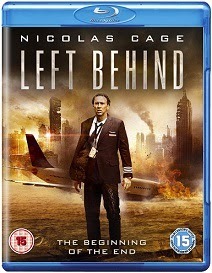 Based on the New York Times' best-selling novel, LEFT BEHIND is an apocalyptic action thriller starring Academy Award® Winner Nicolas Cage. Directed by Vic Armstrong (Amazing Spiderman, Jack Ryan - Shadow Recruit, Indiana Jones) and also starring Chad Michael Murray, Cassi Thomson, Nicky Whelan and Jordin Sparks. A small group of survivors are left behind after millions of people suddenly vanish and the world is plunged into chaos and destruction. Trapped at 30,000 feet, veteran airline pilot Ray Steele (Nicolas Cage - Con Air) must fight to protect the passengers that remain on his flight. Running out of fuel and with his equipment failing, Ray needs to safely guide the plane with the help of news reporter Cameron (Chad Michael Murray - One Tree Hill) who takes over the role of co-pilot in the face of the crisis. On the ground, Ray's terrified daughter Chloe (Cassi Thompson - Big Love) braves the bedlam of the city streets in search of her lost brother and mother.